Catch the slightest of breezes with the Jackite Mallard Duck Drake Kite. This intricately designed kite uses its 32" wingspan to float on gentle to varying winds either from a pole or from kite string. Simply insert the fiberglass rod into the wings of your kite and with a few minor adjustments, you are ready to fly. Because a Jackite is so wind sensitive, you can fly it with as little as 10 feet and as much as 200 feet of line. Constructed of durable Tyvek, this kite is water and tear resistant. The Mallard Duck Drake Kite's full color graphics are printed with impressive detail using high quality inks to resist fading. The Jackite Mallard Duck Drake flies so realistically that others will believe you have a bird tied to a string. Made in the USA. Ninety day limited warranty. 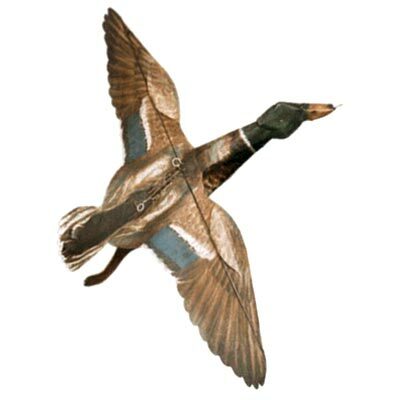 Note: This Jackite Mallard Duck Drake Kite may be flown from any lightweight fishing rod.